Devolved leaders will stress the need for unfettered access to the European Single Market at a summit meeting today with UK government ministers which is set to be dominated by Brexit. Ahead of the British Irish Council summit near Cardiff, Welsh First Minister Carwyn Jones called for firm commitments on free trade. Mr Jones, who is hosting the event, said single market access had become even more important amid the prospect of US protectionist policies in a Donald Trump White House. Mr Jones said: “This is a changing world and these are tumultuous times. But our focus on retaining full and unfettered access to the single market is unwavering. Mr Jones will be joined by Nicola Sturgeon, Northern Ireland First Minister Arlene Foster and Deputy First Minister Martin McGuinness, and the premier of the Irish Republic, Taoiseach Enda Kenny. Welsh Secretary Alun Cairns, Northern Ireland Secretary James Brokenshire and Parliamentary under secretary for exiting the European Union Robin Walker will be among UK government representatives attending. 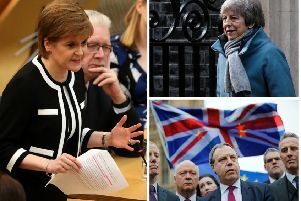 Ahead of the event, the Scottish Government said the UK must not be “driven-off a hard Brexit cliff edge”.